Flight control maneuvers are very important systems where correct functioning is crucial. At the same time, their dynamics is so complicated that the analysis of collision avoidance protocols in air traffic management is pretty challenging. These protocols direct aircraft, which are flying close, to flight paths which respect the protected zones of the aircraft. 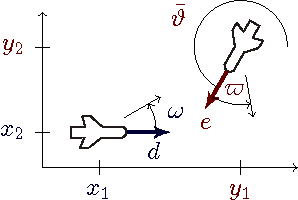 The dynamics of aircraft depends on several parameters, including positions, linear velocities, angular velocities. It is described in terms of differential equations for flight and computer control algorithms. Several collision avoidance maneuvers have been proposed to resolve conflicting flight paths. The left figure illustrates the collision that happens in uncontrolled flight. The middle figure illustrates a classical roundabout collision avoidance resolution, which works successfully. The right figure illustrates an unsuccessful choice for classical fixed roundabout collision resolution attempts. It was found by our hybrid systems verification tool. Possible advanced aircraft maneuvers for collision avoidance include the tangential roundabout (left) and flyable roundabout maneuver (right). To prove correctness of those maneuvers, we have proved formulas in differential dynamic logic (dL). For example, the following dL expresses that two aircraft x and y always remain safely separated by the protected zone if they are safely separated initially and follow the tangential roundabout collision avoidance maneuver trm: safeSeparation(x,y) -> [trm]safeSeparation(x,y) We have proved this formula in the dL proof calculus. For details on the model, the definition of the formula safeSeparation(x,y) and the proof, see . The key proof techniques are the proof calculus for differential-algebraic dynamic logic  and differential invariants . More complex properties about more complex systems, including a flyable roundabout collision avoidance maneuver, are proved in follow-up work [6,5]. We have proved corresponding safe separation properties about distributed air traffic control with arbitrarily many aircraft and dynamic appearance and disappearance of aircraft in quantified differential dynamic logic  using quantified differential invariants . We have considered a class of distributed collision avoidance controllers designed to work even in environments with arbitrarily many aircraft or UAVs . We have proved that the controllers never allow the aircraft to get too close to one another, even when new planes approach an in-progress avoidance maneuver that the new plane may not be aware of. Because these safety guarantees always hold, the aircraft are protected against unexpected emergent behavior which simulation and testing may miss. This is an important step in formally verified, flyable, and distributed air traffic control. The next-generation Airborne Collision Avoidance System (ACAS X) is intended to be installed on all large aircraft to give advice to pilots and prevent mid-air collisions with other aircraft. It is currently being developed by the Federal Aviation Administration (FAA). In this paper  we determine the geometric configurations under which the advice given by ACAS X is safe under a precise set of assumptions and formally verify these configurations using hybrid systems theorem proving techniques. We conduct an initial examination of the current version of the real ACAS X system and discuss some cases where our safety theorem conflicts with the actual advisory given by that version, demonstrating how formal, hybrid approaches are helping ensure the safety of ACAS X. Our approach is general and could also be used to identify unsafe advice issued by other collision avoidance systems or confirm their safety. An overview and a thorough investigation of the ACAS X decision table subsequently appeared in an invited paper . More details and additional results on the verification of maneuvers that are safeable, so not necessarily safe right now but can still be made safe by a subsequent advisory, can be found in an extended journal version for STTT . Aircraft collision avoidance maneuvers are important and complex applications. 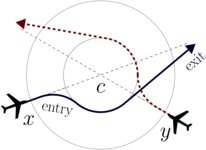 Curved flight exhibits nontrivial continuous behavior. In combination with the control choices during air traffic maneuvers, this yields hybrid systems with challenging interactions of discrete and continuous dynamics. 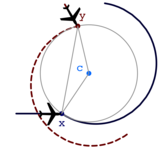 As a case study illustrating the use of a new proof assistant for a logic for nonlinear hybrid systems, we analyze collision freedom of roundabout maneuvers in air traffic control, where appropriate curved flight, good timing, and compatible maneuvering are crucial for guaranteeing safe spatial separation of aircraft throughout their flight. We show that formal verification of hybrid systems can scale to curved flight maneuvers required in aircraft control applications. We introduce a fully flyable variant of the roundabout collision avoidance maneuver and verify safety properties by compositional verification. Also see publications on verification of aerospace systems.